I cannot speculate as to the implications for their sync mechanism, except to observe that the rasters of the three screen segments visible in this video seem to be in good sync, though the frames themselves do not. Different technologies are modeled by selecting a Pixel Model, which is nothing more than a macro image representing a single pixel of the intended display technology displaying white at full brightness. Some sample Pixel Model images representing LCD and various LED technologies are included, but additional Pixel Models may be added easily by the user. PrePix includes a graphical interface for setting up a virtual sign with parameters for Pixel Model selection, pixel dimensions, physical sign dimensions, brightness gain, RGB level adjustments, and source video selection. PrePix supports 30fps wmv video playback as well as jpg, gif and bmp images. Source video is automatically up-sampled or down-sampled to match the pixel dimensions of the virtual video surface. Then, a Pixel Model is applied, followed by the Gain and Color Balance layers. The virtual display is viewable in a virtual 3D space. In the 3D virtual space, the user may select from preset views including “Pixel Match,” which attempts to match large virtual LED pixels onto the PrePix user’s computer display so that the user may get a sense of the look of a virtual video surface in a real, physical space. Viewing a real 11mm LED display from 10 feet away should be comparable to viewing such a virtual display Pixel Matched to a 24” LCD display from the same distance, with the only significant difference being brightness. If this kind of modeling is deemed comparable and effective, then PrePix can be used to determine optimal viewing distances for different pixel pitches and LED technologies without requiring a lot of sample hardware. An even more concrete use of PrePix is to determine the effectiveness of video or image content when displayed on certain low-resolution LED signs. The LED signs on the sides of MTA busses in NYC have pixel dimensions of 288×56. They are often sourced with video content that was obviously designed for a higher resolution display. With PrePix, a content producer can easily preview his video content on a virtual LED bus sign to check text legibility and graphical effectiveness. Full view of virtual LED sign. 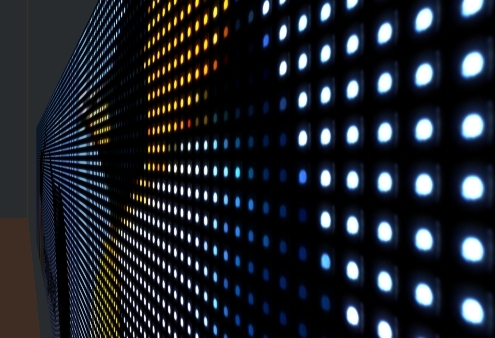 The moire patterns is comparable to that which would be seen in a digital photo of a real LED display. 3Byte would like to develop PrePix further, depending on feedback from users. Please let us know what you think! PrePix can be downloaded here.